I’m cleaning house again. 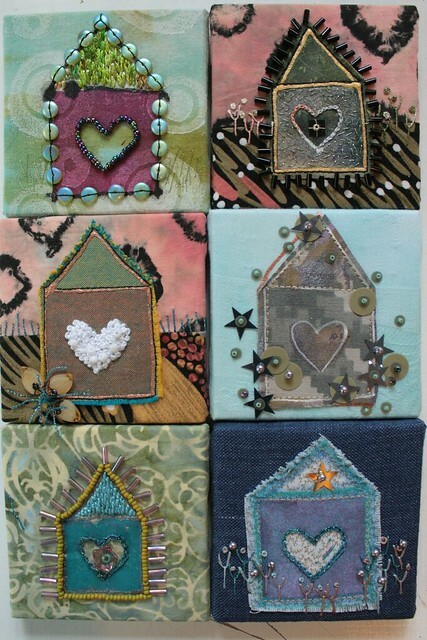 This time it’s the wall quilts that I’m looking at. I built some quilt storage and still have more than I want to fill it with. My work has changed over the last decade or more (as it should) and I have many quilts that just don’t make sense for me to hold on to for exhibits or display in my home. So, I’m going to post them here at bargain basement prices. This is “Hansel ind Gretel,” created for my solo show Impressions of Germany in 2006 and juried into Main Quiltfestival 2006 Wettbewerb “Märchenwelt” (The World of Fairy Tales). It is 29.25″ x 35. The center is has dyed cotton velvet embellished with suggestions of a magical forest with a button and pebble path. There’s even a (boiled and bleached) chicken bone should any inquisitive witches be looking for small children to eat. The backing is an adorable Japanese print with Hansel, Gretel, and forest critters of course. This would make a lovely wall hanging for a child’s bedroom, and if you buy it and remove the bone and pebbles, it would be a snuggly lap or play quilt as well. I’m offering this quilt for $150, mailing included, anywhere in the US. Paypal only. Email me at umzavi(at)hotmail.com if you are interested. Yay, Hidden Garden found a new home. Next up is Nene. I made this quilt as a test for Sherrie Lynn Wood’s Improv Handbook for Modern Quilters. You can read my process story here. Nene didn’t make the cut, and as I look through my records, it didn’t even get added to my spreadsheet of quilts (though it did live on our sofa for a while). Poor thing. I’m obviously not giving it the love it deserves and it should go to a new home. It’s a slightly wonky 41″ x 70″ — a lap quilt for the very long-legged? Machine quilted in a geometric pattern. I’m selling Nene for the bargain basement price of $175, PayPal only. Email me at umzavi(at)hotmail.com if you are interested. Sorry, US only. SOLD, thanks! I am struggling with storage and access of my stuff. Now that we’re pretty much settled, I am figuring out what we need and what actually works in this house. Last week was re-organize the china closet (serving stuff I use often stays, alternate sets of dishes go downstairs and maybe ultimately to consignment). Today was re-organize the linen closet day. Linens stay, pantry items get relocated. The outcome? I have way too many quilts. There is no need for me to store all these quilts that I’m not using on beds or entering in shows. I’ve decided to sell off a few practical bed and lap quilts at bargain basement prices because I don’t need them but maybe someone else does. I’m starting small, but may get more brutal in months to come. The first quilt on the block is titled Hidden Garden and is 55″ x 72. I made it in 2013 as an exercise in using up scraps. The backing is a fun orange with white polka dots. It is free-motion quilted with flowers and leaves. I’m offering this quilt for $300, oh who am I kidding, $200, mailing included, anywhere in the US. Paypal only. Email me at umzavi(at)hotmail.com if you are interested. SOLD Thank you very much! I got my quilting into high gear last week and finished three baby quilts in time to send them off to the Quilt Study Center in Nebraska to be donated to the People’s City Mission. They need quilts of all sizes and styles so it seemed like a super match for my happy little quilts. I hope they will help keep some kids warm this winter. And guess what, no puckers! I have had issues in the past, but this time I starched the backings and used spray baste for the back (but not the top). The biggest factor was probably that I was using cotton backing instead of puffier wool though, so I’ll have to try wool again before proclaiming victory over the pucker, but for now I’m happy.